A four-year starter at defensive tackle for Killeen Ellison, Harris earned all-state honors as a junior (the first team’s only non-senior) after recording 139 tackles, 21 for losses, 6 sacks and 2 forced fumbles for a 3-7 team. Double- and even triple-teamed as a senior, his numbers declined but his stock soared. The 6-3, 285-pounder was named to Texas Football’s Super Team and rated the state’s top defensive line prospect. Recruiting analyst Tom Lemming ranked him the No. 35 overall prospect in the nation and he more than lived up to the billing at Oklahoma, earning all-America honors as a sophomore and junior and winning the Lombardi Trophy before declaring for the NFL Draft. 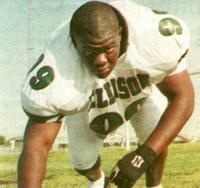 He was named in 2009 to Sports Illustrated’s college football all-decade team. Taken in the first round by Chicago in 2004, he was voted to three Pro Bowls in his eight NFL seasons with the Bears and San Diego Chargers.